I have been pretty obsessed with Basilicata ever since my first visit there 5 years ago to update the Rough Guide to Italy. My dad and I spent a little over a week in Matera, the region’s main tourist attraction, and used the Sassi as a base to gorge on carbs research the eastern part of the region and I have returned many times since. Until this week, though, I had never spent much time in central or western Basilicata, areas that are so profoundly stunning, isolated and unusual that I can hardly get images of their natural beauty out of my mind. Driving through Basilicata is a lesson in topography. Large swaths of eroded sand give way to blooming cheery orchards, verdant rolling hills, and peaks punctuated by towns of Greek, Roman, and Norman origin. 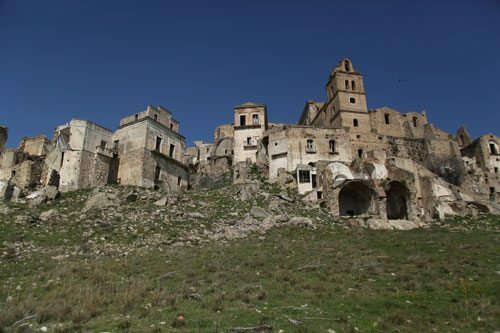 Once such town, Craco, is among the most hauntingly beautiful places I have ever seen. Its littered vaults and broken facades resemble what Matera looked like before the Sassi were (badly) redeveloped into cave hotels, wine bars, and mid-range trattorias. 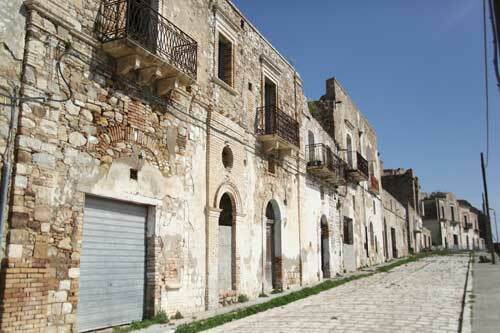 Like the Sassi, Craco was forcibly evacuated and its residents were moved to housing projects. In Craco’s case it was landslides, not disease, that were to blame. During the 1950s, ’60s and ’70s, entire city blocks sheered away from Craco’s periphery, plummeting into the valley below, leaving the shattered medieval nucleus exposed. In successive decades, the city was abandoned and its buildings were plundered by locals, antique dealers, film crews (it was even used as the set for Christ Stopped at Eboli) and vandals. Now the violated shell is nearly completely desserted, save for a group of squatting Romanian shepherds and their goat flock. Recently, part of the site was opened to visitors, who are led through a limited secure portion of the town–after paying a €10 admission fee, putting on a hard hat and signing an injury waver. Mamma Parla and I were the only visitors this week, but the staff of 2 expects a busy summer, particularly as more of the town is expected to open for daytime visits and evening concerts in a few months. While the increased access will raise awareness for this neglected, deserted place, I hope that the fragile site can bring economic promise to the city’s residents without becoming the next Matera, an exploited shell of its former self. 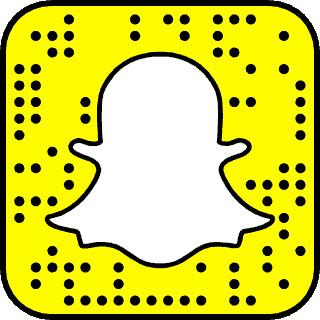 Katie – I visited Craco about six years ago. We saw it from a distance and thought it looked interesting. Little did we know what we would find when we approached. One man I spoke to said the landslides started from a problem with the water table.We were able to walk around a bit and it was surreal to see this abandoned place. I love the movie “Christ Stopped At Eboli” and knowing it was filmed here makes me want to see it again. 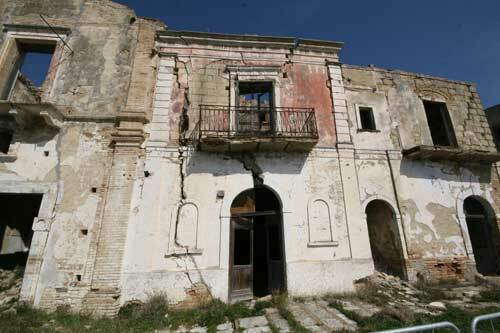 We also went to Aliano, where Carlo Levi lived in exile – and even met an old woman who knew him. I can’t wait to get back to this part of the country – so much beauty. Say hi to mamma Parla for me and continuing having fun together! I just re-watched “Christ Stopped at Eboli” and thanks to your post learned this is where it was filmed. I too love Basilicata and can’t wait to go back. My mother and father were born and bred in the nearby village of San Mauro Forte and when visiting my grandparents in my village I was fascinated by the panoramic views from my grandparent’s balcony. 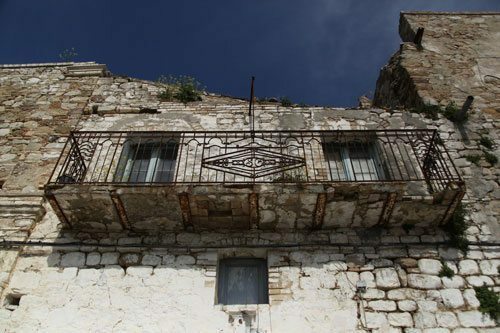 You could see many mountain top villages from the balcony and the nearby vicinity of where he lived. Stigliano, Salandra, Ferrandina but Craco was the most fascinating of all. I don’t know why but it always had an aura of mystery when I looked over to see the town The poignant tower always prominent even on a slight misty day. It had prominence about it, more than any other panoramic view even though it was further away than Stigliano and Salandra. In 1989, I came within metres of this haunting town for the first time on a bus journey on route to the port of Otranto and needless to say it was an amazing experience to see the haunting and mysterious town so close up. 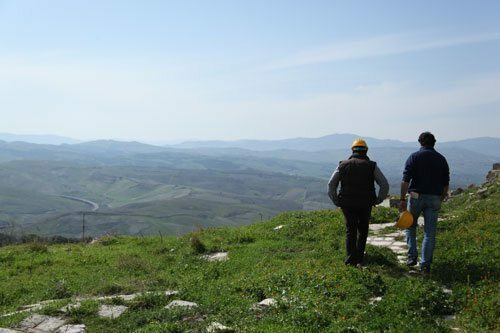 Hi Katie, I’m off to Basilicata for a few days later This year and want to see Craco,..any info on who does the tours, or do we just turn up? Craco is so mysterious and magical! 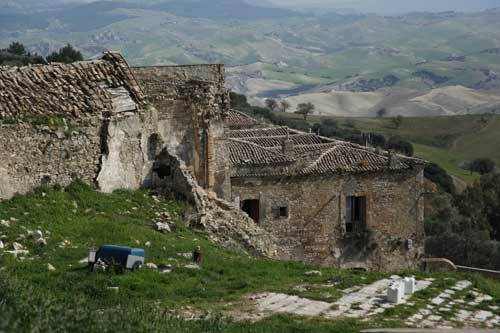 Katie, I give you all the love and respect for visiting Craco because for us Lucani that place can spook ya! Visited Craco in September, just turned up and there was a small group of us…. brilliant. I’m still having fun manipulating some of the images I took that day.